Morgan Steinert recently graduated with her undergraduate degree in aerospace engineering. 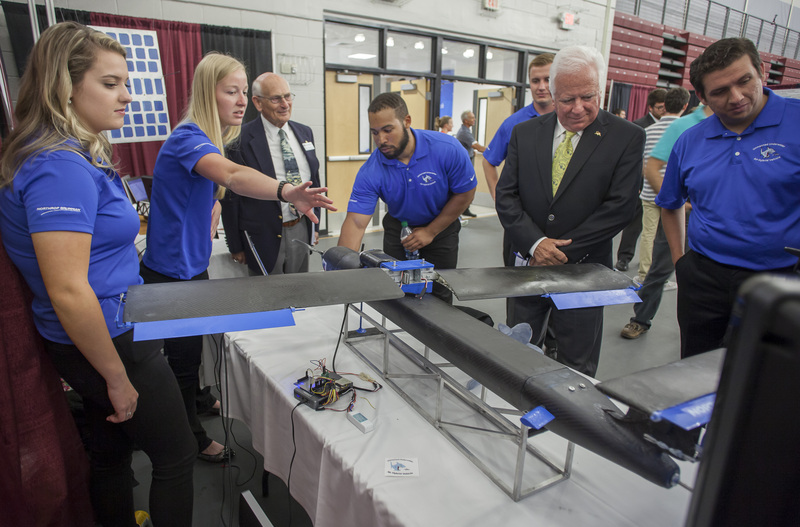 Before graduating she headed up Sharkbait, her student design team’s unmanned underwater/air hybrid vehicle, which you can read more about here. I’m originally from a smaller town in Wisconsin. I came to Florida Tech to pursue my passion, aerospace Engineering, and was given the opportunity to play collegiate basketball. Both basketball and the advisory committee allowed me to meet new people of various backgrounds and be involved in service projects throughout the community. In 2014 I was given the Female Student Scholar Athlete award. I am also a member of Tau Beta Pi and Phi Kappa Phi. Currently, I am the project manager for an unmanned underwater-air hybrid vehicle senior design project. From an early age I have always had a fascination with airplanes. I realized my strength in math and other science during my early school years. From what I knew at the time, I could never find a good profession fit with my interests. While watching Iron Man one day there was a scene where one character stated he designed airplanes. The scene inspired me to research the profession that would design planes and came upon aerospace engineer. I have continued to work as hard as I can. My knowledge, organization skills, and overall habits have fellow students not simply view me as a woman in engineering, but a natural leader. I would tell my younger self to never doubt or underestimate yourself. It is important to know your own worth and be confident so others have no reason to doubt your abilities. Pursue your passion and do not let others sway them. The most surprising aspect of STEM is how competitive it is, with men and women both. Most students were top of their classes and are extremely intelligent individuals. It can be intimidating, but it keeps you humble and working hard. Encourage more job shadowing and internships in high school. This will help young women see the great role models out in the work place and inspire them to pursue a career in STEM more.